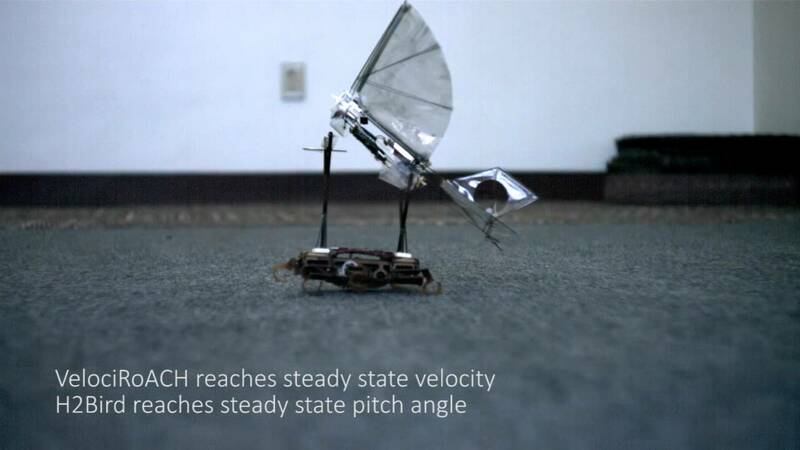 Welcome the VelociRoACH” and his trusty sidekick “H2Bird”, a brainchild of the Researchers at the University of California at Berkeley and is a part of a much broader effort to create robots that are based on nature and animal movement, according to a TIME report. Miniaturization is the buzzword today and the world is turning to nano technology in a big way. It is a nano sized bug like robot which crawls on the ground and can launch a moth like assistant robot into the air for surveillance. Things are fast looking up with a nano sized robotic critter which can race across the ground with a moth piggy riding on its back. Both work like a team and each able to conduct surveillance on the ground and in the air. VelociRoACH does not feature the common straight legs or the wheels as is commonly seen in such robots. Instead it features C-shaped legs. They are perfect for scurrying across the ground carrying the H2Bird on its back. The VelociRoACH builds up enough speed to launch the moth-like robot into the air. Researchers at the University of California at Berkeley thought of an ingenious solution and instead of cramming a number of functions into one robot which is not only impractical and prone to failure, created two nano sized robots which work as a team and synergistically with their own specialized capabilities. The small innovation meant a lot by the way of cost saving. The arrangement led to a cutting of cost for moving the robots by 16%. This can be better understood as follows- If both the robots had to move a distance of 100 meters and the H2Bird has to fly 20 meters by air, a joint team of robots does it much better than one robot trying to do all of the jobs.